Abstract | Why are the walls, floors, and ceilings of data centres always painted white? 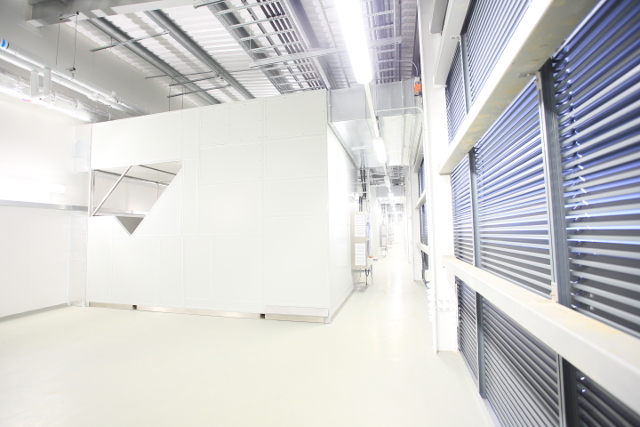 Photographs of data centre interiors tend to focus on the advanced technologies contained within them, while the surrounding white surfaces disappear into the background. Bringing this overlooked design feature to the foreground, this essay explores the technical functions, temporalities, and transparencies of white space within data centres. Résumé | Pourquoi les murs, les planchers et les plafonds des centres de données sont-ils toujours peints en blanc? Les photographies de l’intérieur des centres de données ont tendance à se concentrer sur les technologies de pointe qu’elles contiennent, tandis que les surfaces blanches environnantes disparaissent en arrière-plan. En mettant en lumière cet élément de conception souvent négligé, cette étude explore les fonctions techniques, les temporalités et les transparences de l’espace blanc dans les centres de données. And “white” appears. Absolute white. White beyond all whiteness. White of the coming of white. White without compromise, through exclusion, through total eradication of non-white. Insane, enraged white, screaming with whiteness. What then is the essential nature of cloudiness? “White space” is a term used in the data centre industry to describe the space allocated for IT equipment. It is the space occupied by server cabinets, storage, network gear, racks, air-conditioning units, and power-distribution systems. The phrase also refers to the empty, usable square footage that is available for the deployment of future IT equipment. 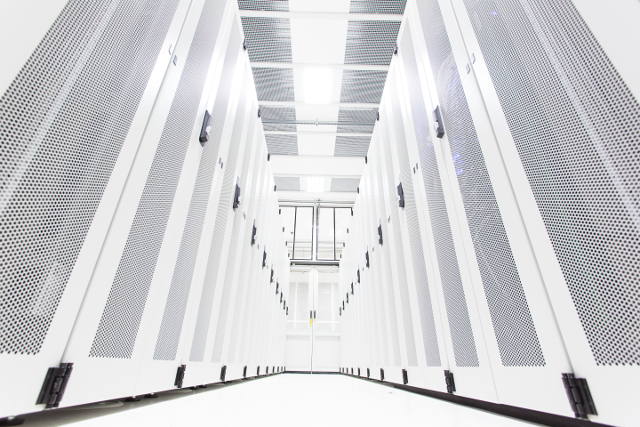 Optimising white space is a key part of data centre design and management. Generally speaking, the more white space the better, as the ability to expand computing capacity is essential to ensuring long-term business growth. White space management (WSM) is an increasingly valuable skill for data centre managers who should be able to maximise usage of white space by strategically deploying IT equipment to increase facility efficiency and save space. Weaved around three photographs of the interior whitescape of a data centre managed by Secura Data Centres in the north-east of England, this experimental essay blends insider (emic) and outsider (etic) voices together to explore the technical and aesthetic – “technoaesthetic” – operations of white space. The term “technoaesthetics” aims to capture the fusion “of appearance and utility” (Masco 368) that white space encompasses by addressing the ways in which the whitewashed surfaces of the data centre have a technical function but also an aesthetic (and therefore social, political, and historical) dimension. A variety of commentators have recently begun to grapple with cloud computing as both a metaphor and a material infrastructure. It is typically argued that the metaphorical conceit of “the cloud” evokes images of ethereality and immateriality that actively erases the physicality of Internet infrastructure and rhetorically conceals the political realities of its practices and processes. Critically and creatively exploring the gap between the metaphor of the cloud and its material components, this nascent body of work has attempted to draw attention to the fibre-optic cables, pipes, wires, and satellites that are seemingly removed by the misleading cloud metaphor (Parks; Blum; Starosielski). Across these diverse projects, perhaps the most persistently examined object of cloud infrastructure has been the data centre (Arnall; Bridle; Graham; Holt and Vonderau; Hu; Jones; Levin and Jeffery). Yet, while data centres and the technical equipment contained within them have been subject to growing critical reflection, the white floors, ceilings, walls, and surfaces have been left largely ignored, appearing only as a passive backdrop for the action of other sociotechnical arrangements. Histories of architecture have long-recognised the structural role of architectural features that may at first appear “superficial”, such as the white wall (Wigley; el-Khoury). Space, too, is never a neutral backdrop but a product of people’s interactions with the material world (Lefebvre). Building on insights from the history of modern architecture and bringing the white space of data centres into relation with other white spaces from popular culture, this essay will explore what this overlooked design feature may tell us about the cloud and its supporting infrastructure. The last decade has seen a slow but steady increase in images of data centres circulated within the global mediasphere, with visual technologies facilitating the aestheticisation of the white data centrescape. The fictional action of a growing number of films and TV shows has occurred within the white space of data centres (Smolaks), while photographs of these “architectural curiosities” (Stasch 77) frequently garnish articles, exposés, and essays in the popular press. Chanel even adopted a data centre theme for their SS17 event for Paris Fashion week, with the catwalk transformed into a white floor flanked by white server racks (Moss). It is the aesthetically-pleasing white spaces of the data centre that are most often photographed or filmed in advertising campaigns and other media products. Rarely do we see what some practitioners refer to as the “grey space”: the unphotogenic backstage areas of the data centre where back-end equipment like switch gear, uninterruptible power supplies, transformers, chillers, and generators are located. White space plays an important role in mediating and transforming popular imaginaries of the cloud. We might say, then, that data centres are steadily coming out from behind the screens of the digital world and are increasingly infiltrating the popular imagination through a number of visual channels and media forms. The data centre industry’s increasing visibility is heavily entangled with several major political developments. Perhaps the most significant of these was the leaking of top secret documents by ex-NSA contractor Edward Snowden in 2013, which revealed extensive partnerships between government mass surveillance projects and tech companies like Microsoft, Google, Facebook, and Apple, who granted organisations permission to access data stored in their data centres as part of various surveillance programs (such as the NSA’s PRISM and GCHQ’s Tempest programs). Tech companies have released extensive visual footage of their data centres as part of a larger effort to restore public trust in the post-Snowden environment. The regular and highly publicised hacking of global corporations such as Sony, TalkTalk, and Yahoo! has further drawn attention to the ethics and (in)security of practices and processes of data storage. Increasingly stringent international regulations on data sovereignty, in which data is subject to the laws of the country in which it is stored, has radically reinforced the significance of geographic space within cloud culture and resulted in a widely-publicised boom in data centre construction in “information friendly” countries like Luxembourg (Dawn-Hiscox) and Iceland (Johnson). Heavy criticism from environmental policy makers over the industry’s excessive (fossil fuel) energy consumption to power and cool IT equipment has also played a central role in many companies relocating their data centres in Nordic countries, where they can take advantage of the naturally cool climate. These sociopolitical and geopolitical developments have steadily brought data centres into the media spotlight, mobilising popular opinion as well as academic reflection. Indeed, a gradual cultural awakening to the political realities of data storage has occurred: data in “the cloud” is increasingly figured less as some ethereal evaporation in a kind of Internet water cycle but is increasingly imagined to be stored – held hostage, even – on corporate hard drives hidden in sinister server farms. Public debates and discussions about data centres and cloud computing within the popular press and academia thus tend to revolve around questions of privacy, trust, and transparency. It is largely in response to accusations of non-transparency that tech companies like Facebook, Amazon, Apple, Microsoft, and Google have engaged in rigorous publicity campaigns visualising their data centres (or “fulfilment centres” in Amazon’s case) in an attempt to improve their public image. As data centres begin to reposition themselves more visibly within a variety of media landscapes, a flood of data centre imagery has been unleashed showcasing the physical insides of the Internet. Google has released photo galleries, panoramic tours and video footage of their data centres, featuring the friendly (and ethnically and gender diverse) faces of the staff who work in these buildings. Amazon has employed a similar strategy, releasing high-definition footage of their machine-warehouses interspersed with brief talking-head interviews of their warehouse packers (or “fulfilment centre associates” in Amazon parlance). Extensive photo and news coverage accompanied the 2013 opening of Facebook’s “green” data centre in Luleå, Sweden (Jones; Vonderau). Facebook also made the blueprints public for their recently constructed facility in Prineville, Oregon (Quirk). Microsoft has similarly jumped on the bandwagon, making free QuickTime video tours of their data centres available for download from their corporate website. In fact, today, the majority of data centres – from the corporate behemoths to the independent colos – have some form of image gallery or 3D virtual tour on their websites where you can scroll through various photographs or view video footage of the facility. Data centre interiors tend to be represented as specialised technological environments full of colourful cables, complex wiring and futuristic-looking IT equipment. Yet, while the specific machinery pictured in these publicity shots always varies, the white ceilings, walls, and floors that form the background against which the equipment is displayed, rarely, if ever, changes [Figure 1]. Figure 1: A world of white space. Journeying through data centres – whether in person, by browsing online images, or through a 3D virtual tour of a facility – is perhaps the closest a human can get to being sucked into the Internet. On the server hard drives locked behind the perforated doors of the white metal cabinets, data is stored and accessed by Internet users from all over the world. The whirring machinery and the giant cables and wires are the organs and intestines of the Internet. Seemingly endless air-conditioned corridors of identical server cabinets surround you as you venture through this strange data space. But this is not the 8-bit “electronic world” of “cyberspace” as imaged and imagined in the vintage visions of the film Tron (1982), William Gibson’s Neuromancer (1984), or any other “human-sucked-into-a-computer” narrative from cyberculture films and literature – the visual strategies of which were predominantly informed by the aesthetics of early graphics programs and the computer-generated neon-grid geographies of early arcade video games like Pong. Instead of black backdrops vectorised by space-time neon gridlines we have a vast expanse of whiteness. The only neon here comes from the flickering server-lights and their reflections in the fluorescent white of the floor-space when the lights are turned off. This is not to say that the visual strategies of data centre advertising campaigns do not play with the semiotic remnants of these retro cyber-visions. “Data centres often turn their lights off for photo shoots so you can properly see the neon,” Stuart Hartley, the Chief Technology Officer at Secura explained to me, “simply because it makes them look more virtualistic” (Hartley). The image of the server-cabineted corridor [Figure 2], typically bathed in blue neon, has become the canonical icon of the data centre. Produced and reproduced by and through “patterns of imaginal repetition” (Frankland 103) and mass media circulation, it is the shot of a neon-soaked aisle flanked by racks of encaged servers that is no doubt the most frequently encountered representation of data centres today (returned by any basic Google search for “data centre”). In advertising images, the symmetrical geometries of the cabinets are typically combined with a low-angle shot, cinematically transforming the server cabinets into sublime, giant monoliths reminiscent of the extra-terrestrial machine-monoliths in Stanley Kubrick’s 2001: A Space Odyssey (1968). In keeping with William Gibson’s (60) various descriptions of cyberspace as “distanceless” and “extending to infinity”, the whitewashed interior makes this data centre appear sublimely vast. Painting surfaces white is a technique commonly deployed by interior designers to make spaces appear larger than they are. The hyper-illuminated, uniform whiteness of this data centre obscures the points where the walls, ceiling, and flooring join together, creating the illusion of an almost dimensionless space that appears “seamless, continuous, empty, uninterrupted” (Batchelor, Chromophobia 9). In this respect, the white innards of the data centre perhaps have more in common with the contemporary visualisations of virtual spaces that we find in multi-dimensional modelling software programs, virtual world editors (sometimes referred to as “sandboxes”) and the famous virtualistic white spaces that featured in The Matrix franchise (1999-2003). Virtualisation enables data centres to maximise the utilisation of their hardware and “has allowed for thousands if not millions of users to share a data centre in the cloud” (Hu 61). By pooling IT resources together in this way, facility operators are able to reduce the number of physical devices in the data centre and reclaim vital square footage. “Virtualisation”, Cardy summarised, “means less hardware [and] more white space”. While the term “virtualisation” conjures imaginaries of dematerialisation or non-physicality, there is always an underlying physical machine doing the work. At the same time, however, virtualisation can be seen as a dematerialising process to the extent that its implementation enables data centres to eliminate excess physicality in the form of surplus hardware and free-up white space. For data centre practitioners, then, the white, dimensionless spaces of the data centre not only look like the computer-generated spaces that feature in popular imaginaries of “the virtual”, but are the product of virtualisation itself, symbolic of the moment when the virtual has become infrastructured. Figure 2: The iconic image of the server-cabineted corridor. Whiteness has long-featured in cultural images and imaginations of the future. The white wall was the icon of the modernist architectural movement pioneered by Le Corbusier – and later associated with minimalism. It reached the height of its popularity during the interwar period and was central to the modernist project’s desire to whitewash the past and build a new future after the First World War (Wigley; Ballard). White space has also been a recurring motif in science fiction films, from George Lucas’ THX 1138 (1971) to the Wachowski’s The Matrix (1999). White surfaces are a central design feature of Hollywood spaceship interiors – from the Space Age cinema of the 1960s and 70s to present-day blockbusters and video games. When combined with the advanced computer technology and the hermetically-sealed metallic surfaces, the white ceilings, floors and walls, give data centres an unmistakably spaceship-like appearance. “White surfaces just have that futuristic feel about them”, Hartley explained to me. “It’s important for a data centre to look futuristic; you don’t want them to look old or dated, as this doesn’t inspire confidence in the client… white can make a facility look like it’s going to last well into the future” (Hartley). Yet, while the white spaces of science fiction and modernist architecture imaged and imagined new possible futures, the white spaces of the data centre do not attain their futurity by virtue of their active role in bringing new futures into being but rather seem to achieve their futuristic effect by virtue of their association with these future-making projects of the past. In this way, the whitewashed technoaesthetics of data centre interiors creates more a “retroactive sense of futurity” (Jakobsson and Stiernstedt 2012:112). They do not so much participate in the production of new possible futures but rather, participate in the visuo-nostalgic reproduction of futures past. The technical function of white space as part of a broader anticipatory practice known as “future-proofing” further complicates the data centre industry’s relation to the future. “Future-proofing” is an emic term that describes an approach or design philosophy to data centre resources that aims to save infrastructure and IT from rapid obsolescence. In the fast-changing world of the data centre, where new (and extremely expensive) equipment is constantly being developed and deployed, it is important that this equipment will last well into the distant future and not be “outdated before it’s even installed”, as Cardy put it. Maximising the availability and production of white space (through techniques like virtualisation as well as strategically organising the arrangement of IT equipment) is a future-proofing measure that aims to ensure the continued growth and future of the data centre. The practice of maximising the availability and production of white space so that data centres do not get too full too quickly is guided by logics of preparedness, contingency, redundancy, and resilience rather than ideals of renewal or regeneration. While the presence of white space represents the possibility of future expansion and growth, the future, as embodied in the concept of future-proofing, appears not so much as something to be embraced but something to protect the data centre from, to stop the future from getting in and outdating the technology. White space not only regurgitates the mise-en-scène of futures past, but, as a future-proofing technique becomes a barricade against future futures, blocking them out. The aesthetic strategy of whitewashing, which produces the illusion of seamlessness, further reinforces this hermetic imaginary. While discourse on Big Data is dominated by optimistic hypes and hopes for a better future, the anticipative white spaces of the buildings in which this proleptic data is stored reflect an inability to imagine that future as anything other than threatening. The startling whiteness of their architectural surfaces presents data centres as sterile spaces. Data centres are highly controlled environments. A variety of contaminants can cause lasting damage to the expensive equipment housed within these infrastructures. Organic and inorganic particulate matter (PM), such as dust, plant pollens, human hair, liquid droplets and smoke from cigarettes and nearby traffic can interfere with the drive mechanisms of magnetic media (such as the read/write actuator arms in hard disk drives), causing corrosion, oxide flake-off, wasted energy, and permanent equipment failure. The white surfaces and well-lit rooms serve to make visible any foreign matter that may have entered the facility. Here the data centre whitescape joins “the doctors white coat, the white tiles of the bathroom [and] the white walls of the hospital” (Wigley 5). Furthermore, for security reasons, most data centre construction standards prohibit windows that provide “visual access” to the data centre, particularly the computer rooms, data floors, and other secured areas. The reflective properties of the white surfaces therefore enable facility operators to get more mileage out of their artificial lighting, reducing electricity costs. For this reason, often the IT equipment itself is painted white [Figure 2]. The brightness of white surfaces, where light is reflected, is a frequently deployed trope in the domain of public health, where the white wall has long-played a prominent role not only in the exercise and display of cleanliness, but also “in the construction of the concept of cleanliness” (el-Khoury 8; Berthold). In an analysis of urban sanitisation projects in late-18th-century France, Rodolphe el-Khoury suggests that the rhetorical power of the white surface stemmed primarily from its visual properties, or, more precisely, from its capacity to translate the condition of cleanliness into an image. El-Khoury argues “The norms of cleanliness were moral rather than functional” and “had more to do with ‘propriety’ than with health” (8). In this way, from the 1780s whiteness came to function as an evident index of cleanliness in the domain of public health and hygiene – a symbolic code that continues to be deployed in diverse arenas today – from sanitation photography to data centre security. This “evidentiary” relationality of whiteness and cleanliness, is, of course, social and historical and tightly tied to long-standing racial associations that emerged from the classificatory projects of the Enlightenment era. During this period, whiteness was brought into relation with concepts of cleanliness, purity, and civilisation, while blackness was aligned with dirt, impurity, and backwardness (Garner 175; Cretton; Dyer). Whiteness-as-cleanliness is thus a social cleanliness. Jonathan Shore, the Data Hall Manager at Secura, suggested that “white looks virtuous, innocent”. He elaborated by explaining that, in the hyper-luminous data halls, “there are no dark corners for dirt to accumulate or secrets to hide” (Shore 2016b). Here whiteness eliminates darkness, transforming data centres into clean and moral spaces in the process. In our conversations, data centre professionals would often align the internal whiteness of the data centre with a social or moral cleanliness, reflective of the data centre’s responsibility, security, and, perhaps somewhat paradoxically, transparency. The white interiors of data centres stand in stark opposition to other architectures of the so-called “Information Age”, in which transparency of information has arguably led to transparent interiors and exteriors (Shoked 101). Contemporary architectures are typically defined by see-through surfaces, open spaces, and spherical shapes that eliminate angles and corners. Such architectures reflect non-hierarchical, holacratic management forms and aspire to ideals of openness and transparency. Walls are not white but glass, while ceilings and floors are stripped back to expose the bare pipes, concrete, or metal foundations as if there is nothing to hide. In contrast, within the rectangular geometries of data centres, corners proliferate and transparent materials like glass, Perspex, and translucent polycarbonate are actively avoided. The ubiquitous white surfaces in data centres are overtly opaque yet provide Shore with a claim to transparency by virtue of that very opacity. Indeed, the extreme opacity of Secura’s white spaces highlights – rather than hides – the act of concealment that is usually elided within images of buildings or spaces claiming to be transparent. Shore suggests “The opacity of the white basically draws your attention to what you can’t see” (Shore 2016b). Here, white space does not just symbolise cleanliness but cleanses itself from the ideology – or ‘tyranny’ – of transparency (Strathern). As white walls gradually became a staple of modern architecture, whiteness as a signifier of cleanliness also came to signify absence – not only of dirt, but also of visual stimuli (el-Khoury). The colour white became a neutral or blank background that was supposedly colourless in the same way white people were “raceless” (Cretton; Dyer). As such, white walls did not need to be see-through to be transparent, because they “are just what they are” with “no possibility of lying” (Batchelor, Chromophobia 10). Yet with the vast whited rooms of the Secura data centre, a different logic is at work. While Le Corbusier’s white wall supposedly rendered architecture transparent by liberating the walls from visual decoration, Secura’s white wall problematizes the relation between transparency and visibility (Lefebvre 76; Kuchinskaya). In Secura’s data centre facilities, it is not so much about what can be seen, but whether what can’t be seen is shown. By showing what can’t be seen (e.g. photographing the white cages of the servers but not the servers themselves) the luminous whitescapes of this data centre make visible the limits of transparency-as-visibility. At the same time, we must not forget the “grey spaces” that exist in the often unseen background of the data centre (though the ceilings, floors and walls of these spaces are still often painted white). Indeed, as David Batchelor reminds us, “the luminous is almost always accompanied by the grey” (60). While the emic division between “white” and “grey” space may at first appear to correspond to “visible areas” and “invisible areas” respectively, rather, these represent two different regimes of in/visibility. As we have seen, the aesthetically-pleasing white areas, though frequently-visualised, are composed of registers of visibility and invisibility and the same goes for grey space. At the same time, Shore’s assertion that whiteness eliminates dark corners suggests that, though the white spaces of the Secura data centre may aspire to operate beyond transparency, they are still entangled within Enlightenment associations of light, whiteness, truth, and morality that underpin contemporary regimes of transparency (Mehrpouya and Djelic). Images of white space, then, may be seen more as a kind of performative playing with the signs of transparency, allowing data centres to hover somewhere between revelation and concealment. Another white space that hovers between revelation and concealment is the famous virtual environment from The Matrix (1999) known as the Construct. This cinematic white space is a productive tool for thinking through some of the ways in which white space may operate in data centre imagery. The Matrix is set in a dystopian future where intelligent machines keep humans in a state of suspended animation, harvesting their energy to power their machine world. Humans do not experience this machinic reality. Rather, they are plugged into a neural-interactive virtual reality known as the Matrix. The protagonist is the computer hacker Neo, who learns the truth about the nature of reality from a mysterious figure named Morpheus. The film follows Neo as he goes through the process of discovering the true conditions of his existence, waking up from the ideology of the simulated Matrix and fighting in the war against the sentient machines. In perhaps one of the most memorable scenes, a data probe is inserted into the headjack at the base of Neo’s skull which plugs him into the Construct. He is immediately transported into a completely white and dimensionless space. Morpheus is standing in the seemingly endless whitescape, along with two leather armchairs, a 1950’s television set, and a small circular table. Morpheus explains that this is the Construct, a “loading program” that provides users with a virtualised space in which training simulations are run. It is in the Construct that Neo begins what we might call – following the psychotropic writings of Henri Michaux (xiii) and Timothy Leary – the process of “deconditioning”. For these figures, psychedelic drugs had a demystifying effect on human consciousness, enabling users to free themselves from the ideological shackles of their social conditioning and thus “awaken from a long ontological sleep” (Leary 76). Whiteness, in particular, played an important part in Michaux’s entheogenic experience of mescaline. Similarly, the white space in The Matrix does not just serve as a background against which Neo’s ontological transformation takes place, but is itself a constituent part of this transformation, an active mechanism of deconditioning: it is in and through this space that Neo awakens to a newly-deconditioned plane of existence. Could we see the images of data centres released by technology companies under the guise of “transparency” as similarly operationalising white space? Within tech companies’ representational strategies, the hyper-illuminated white interiors of data centres are analogously positioned as the material, machinic “reality” behind the illusory ideology of the cloud in a way almost identical to the revelation narrative that structures The Matrix. In this way, the use of photographic and video imaging technologies to reveal the physical foundations of the cloud may be seen not simply as practices of visualisation and visibilisation, but also as belonging to rituals of illumination and revelation associated more with the mystic tradition. A crucial similarity between the whitescapes of the data centre and The Matrix is the way in which they reverse the revelation narrative of the mystic tradition (most commonly associated with occultism of secret societies like the Illuminati and Freemasons, but also tied to the psychedelic mysticism of the 1960s). Mysticism is typically underpinned by a dualistic ontology, that is, the postulation of a spiritual and a material realm (Surette 13). In the classic mystical revelation narrative, a transcendental revelation occurs whereby the material or hylic world gives way to the substanceless, immaterial or spiritual plane of noumenal reality (Yates; Surette 13). In The Matrix and the cloud revelation narrative, however, rather than achieving some sort of transcendental access to an immaterial or ethereal realm beyond the cloaked world of matter, we experience the violent return of materiality: Neo is a slave in a machine world; the cloud is concrete. Data centre visual revelations enact a mythic reversal (in Lévi-Straussian terms) of the traditional narrative of mystical illumination. Like the deconditioning process that occurs in the Construct, the aim of the cloud revelation narrative is not so much to open viewers’ eyes and minds to the spiritual, psychical, or divine world hidden behind the material world, but rather to reveal the material reality behind the illusory myth of the cloud. We must, however, not overlook the slight but significant way in which the cloud revelation narrative departs from that of The Matrix. Whereas in The Matrix the white Construct space operates outside of both the virtualised world of the Matrix and the ruins of the present-day world, in the case of the cloud revelation narrative, the white space and “reality” collapse into each other: white space is represented as the reality of the cloud. It is in this functioning, that we find the ideological operation of the data centre imagery released by tech companies and it is precisely here, in this sl(e)ight difference that a number of critics of the data centre industry have positioned their analyses. While these revelatory images of white space were released by tech companies predominantly to promote transparency and improve the public profiles of data centres, critics of the industry have noted that these images offer very little in terms of providing any meaningful insights into the political realities of data storage practices. Glossy close-ups of wires, pipes, and servers “drag” this equipment out of its context (Rojek), concealing the “real” facts about how these buildings operate (Strathern 314). Holt and Vonderau (75) have noted how these images transform cloud infrastructure into a kind of abstract art [Figure 3], obliterating the trace of any relationship between the imaged equipment and larger environmental, political and social processes in which they participate. Indeed, non-specialists will have little clue as to what is being pictured. Critical commentators have thus argued that media economies provide the data centre industry with a circuity in which to mediate its own visibility, “dictating the terms of its own representation” (Levin and Jeffery 8). These coded representational strategies have the inverse effect of rendering these buildings and their social relations more invisible and opaque. Through carefully exposed, angled, and framed photographic and filmic image-products data centres are transformed into beautiful, aestheticised whitescapes, the sociopolitical structures of knowledge and the vested interests that configure the conditions of data centre visibility are effectively whitewashed. Something of a stalemate has thus ensued. While the data centre industry continues to pump out “behind-the-screens” footage of cloud infrastructure, that footage is always suspect, insufficient and concealing something else. Figure 3: The abstract art of cloud infrastructure. Despite the heavy criticism of “the cloud” as a misleading metaphor, in an accidental way, the idea of cloudiness accurately captures the obscurities, opacities, and contradictions of data centres and openly points to the obfuscatory operations of “clouding” or concealing that occur in these spaces. In his Remarks on Colour, Ludwig Wittgenstein focuses his attention on the seemingly trivial fact of white’s opacity and its relation to transparency and cloudiness. “Is cloudy that which conceals forms, and conceals forms because it obliterates light and shadow?” (15). He follows this question with another: “Isn’t white that which does away with darkness?” (Ibid). Whiteness lightens, so the puzzle proposition goes, but clouds, though white, obscure light. The white spaces of cloud infrastructure operate in similarly contradictory ways. While data centres are essential to storing and managing the information that plays such an important part in public imaginaries of the “transparent” information society, their architectures do not readily reflect the logic of transparency associated with the data they store (Shoked). Their hyper-illuminated interiors are completely opaque, but, in a “post-truth” (or, to perhaps be more accurate, “post-transparent”) kind of way, they are arguably more transparent than the suspiciously “over-transparent” architectures of the Information Age. Transparency and opacity cease to be perceived as contradictory. As a future-proofing measure the white spaces of cloud infrastructure are at once orientated toward the future, but also serve to block the threatening future out, steeped in mediatised memories of futures past. Spanning the real and the fictive, these cinematic spaces engage with cultural manifestations of futurity in film, cyberpunk, and interior design, and play with the signs of transparency and visibility to such an extent that physicality, fantasy, and technical function are inseparably entangled. These fantastic buildings, epic in volume, sit at the centre of the ongoing industrialisation of computing, and whiteness thus plays an important part in their functioning, staging, and imag(in)ing (Larkin). Reversing the revelation narratives of mystical experience, the white spaces of data centres perhaps reveal less about “the cloud” and more about cultural fetishisations of the physical sites of production and the inability of analytical dualisms like transparency/opacity, materiality/immateriality and visibility/invisibility to adequately capture and conceptualise the contradictions of digital-industrial infrastructures. Data centre technoaesthetics performatively play with and collapse distinctions between these categories. Questions, accusations, and analytics that fall along these lines appear hopelessly ill-adapted to the post-transparent logics of these architectures and the terrain they traverse. 2001: A Space Odyssey. Directed by Stanley Kubrick. Distributed by Metro-Goldwyn-Mayer. 1968. Appadurai, Arjun. Modernity at Large: Cultural Dimensions of Globalisation. University of Minnesota Press. 1996. Batchelor, David. Chromophobia. Reaktion. 2000. —. The Luminous and the Grey. Reaktion. 2014. Berthold, Dana. “Tidy Whiteness: A Genealogy of Race, Purity and Hygiene.” Ethics and the Environment. Vol. 15, No. 1, 2010, pp. 1-26. Blanchette, Jean-François. “Introduction: Computing’s Infrastructural Moment.” Regulating the Cloud: Policy for Cloud Infrastructure. Edited by Jean-François Blanchette and Christopher S. Yoo. MIT Press. 2015. Blum, Andrew. Tubes: Behind the Scenes of the Internet. Viking. 2012. Cardy, Ian. Head of Disaster Recovery at Secura. Unstructured Interview Transcription. 29 March 2016. Cretton, Viviane. “Performing Whiteness: Racism, Skin Colour and Identity in Western Switzerland.” Ethnic and Racial Studies. 2017. Dyer, Richard. White. Routledge. 1997. El-Khoury, Rodolphe. “Polish and Deodorise: Paving the City in Late-Eighteenth-Century France”. Assemblage, No. 31, 1996, pp. 6-15. Frankland, Stan. “The Bulimic Consumption of Pygmies: Regurgitating and Image of Otherness.” The Framed World: Tourism, Tourists and Photography. Edited by Mike Robinson and David Picard. Ashgate. 2009. Garner, Steve. Whiteness: An Introduction. Routledge. 2007. Gibson, William. Neuromancer. Harper Voyager. 1984. Graham, Stephen. “Data Archipelagos”. CLOG: Data Space. Edited by Kyle May. 2012, pp. 20-22. Hartley, Stuart. Chief Technology Officer at Secura. Unstructured Interview Transcription. 22 March, 2016. Holt, Jennifer and Patrick Vonderau. “Where the Internet Lives: Data Centres as Cloud Infrastructure”. Signal Traffic: Critical Studies of Media Infrastructure. Edited by Lisa Parks and Nicole Starosielski. University of Illinois Press. 2015, pp. 71-93. Hu, Tung-Hui. A Prehistory of the Cloud. MIT Press. 2015. Jakobsson, Peter and Fredrik Stiernstedt. “Time, Space and Clouds of Information: Data Centre Discourse and the Meaning of Durability.” Cultural Technologies: The Shaping of Culture in Media and Society. Edited by Göran Bolin. Routledge. 2012. Kuchinskaya, Olga. The Politics of Invisibility: Public Knowledge about Radiation Health Effects After Chernobyl. MIT Press. 2014. Larkin, Brian. “The Politics and Poetics of Infrastructure.” Annual Review of Anthropology. No. 42, 2013, pp. 327-43. Le Corbusier. The Decorative Art of Today. 1925. Translated by James I Dunnett. Architectural Press. 1987. Leary, Timothy. “The Religious Experience.” Journal of Psychedelic Drugs. Vol. 3, No. 1, 1970, pp. 76-86. Lefebvre, Henri. The Production of Space. Translated by David Nicholson-Smith. Blackwell. 1974. Masco, Joseph. “Nuclear Technoaesthetics: Sensory Politics from Trinity to the Virtual Bomb in Los Alamos.” American Ethnologist. Vol. 31, No. 3, 2004, pp. 349-373. Ghost Rider 2099. Written by Len Kaminski. Marvel Comics. 1994-1996. Mehrpouya, Afshin and Marie-Laure Djelic. “Transparency: From Enlightenment to Neoliberalism or When a Norm of Liberation becomes a Tool of Governing.” HEC Paris Research Paper, No. ACC-2014-1059, 2014. Michaux, Henri. “With Mescaline.” Darkness Moves: An Henri Michaux Anthology 1927-1984. Translated by David Ball. University of California Press. 1994. Parks, Lisa. “Obscure Objects of Media Studies: Echo, Hotbird and Ikonos.” Strange Spaces: Explorations into Mediated Obscurity. Edited by Andre Jansson and Amanda Langerkvist. Routledge. 2009. Rojek, Chris. “Indexing, Dragging and the Social Construction of Tourist Sights.” Touring Cultures: Transformations of Travel and Theory. Edited by Chris Rojek and John Urry. Routledge. 2003. Shoked, Noam. “Transparent Data, Opaque Architecture.” CLOG: Data Space. Edited by Kyle May. 2012, pp. 100-101. Shore, Jonathan. Data Hall Manager at Secura. Unstructured Interview Transcription. 7 April 2016a. —. Data Hall Manager at Secura. Unstructured Interview Transcription. 25 August 2016b. Space 1999. Created by Gerry and Sylvia Anderson. ITV Network. 1975-1977. Stasch, Rupert. “The Camera and the House: The Semiotics of New Guinea ‘Treehouses’ in Global Visual Culture.” Comparative Studies in Society and History. 53(1), 2011, pp. 75–112. Starosielski, Nicole. “Fixed Flow: Undersea Cables as Media Infrastructure.” Signal Traffic: Critical Studies of Media Infrastructure. Edited by Lisa Parks and Nicole Starosielski, University of Illinois Press, 2015, pp. 53-70. Strathern, Marilyn. “The Tyranny of Transparency.” British Educational Research Journal. Vol. 26, No. 3, 2000, pp. 309-321. Surette, Leon. The Birth of Modernism: Ezra Pound, T.S. Eliot, W.B. Yeats and the Occult. McGill-Queen’s University Press. 1993. The Matrix. Directed by The Wachowski Brothers. Distributed by Warner Bros. 1999. THX 1138. Directed by George Lucas. Distributed by Warner Bros. 1971. Vonderau, Asta. “On the Poetics of Infrastructure: Technologies of Cooling and Imagination in Digital Capitalism.” Zeitschrift für Volkskunde. Beiträge zur Kulturforschung. Vol. 113/1, 2017, pp. 24-40. Wigley, Mark. White Walls, Designer Dresses: The Fashioning of Modern Architecture. MIT Press. 1995. Wittgenstein, Ludwig. Remarks on Colour. Blackwell Publishing. 1979. Yates, Frances A. The Rosicrucian Enlightenment. Routledge. 2002. All names and identifying details have been changed to protect the privacy of individuals. The material presented in this article is drawn from fieldwork and interviews with data centre practitioners over a 15-month period. See Holdt and Vonderau for a more comprehensive overview of the “technopolitics” of data centre “hypervisibility”. The Simpsons’ “Homer3” episode from Treehouse of Horror VI (1995) and Marvel’s Ghost Rider 2099 comic book series (1994-1996) are also clear examples of this grid aesthetic. Jean-François Blanchette has provided a detailed historical contextualisation of virtualisation (7). For a nuanced analysis of virtualisation as a political ideology productive of neoliberal subjectivities, see Tung-Hui Hu (2015). Le Corbusier introduced his theory of the white wall in his book, The Decorative Art of Today (1925). While the focus of this essay is colour, the politics of texture play an important role in the production (and selling) of data centre space. A significant function of the hard surfaces of the data centre is their role as security shields against electromagnetic radiation. These surfaces are usually made from specially reinforced metallic panels designed to block the various frequencies, fields, signals, waves and rays from threatening sources of electromagnetic radiation such as lightning, electromagnetic pulses, space weather, and radio frequency interception devices. The influence of the cinescape of the spaceship in data centre design is perhaps best illustrated by the space station-themed data centre developed in 2013 by Bahnhof, a Swedish Internet service provider (Miller). Influenced by sci-fi TV shows like Star Trek (1966-1969) and Space 1999 (1975-1977), the outer shell of the data centre is an inflatable dome reminiscent of Buckminster Fuller’s geodesic domes and was built by Lindstrand Technologies, who previously built the parachute that deposited the Beagle 2 space probe on the surface of Mars. In a promotional video, Jon Karlung, the CEO and visionary behind the science fictional data centre describes how the automated pneumatic entry doors make a Star Trek-style whooshing noise as they open and close (Miller). Jakobsson and Stiernstedt have an insightful analysis of Pionen, an older data centre owned by Bahnhof that is equally science fictional. As Marilyn Strathern asks, “what does visibility conceal?” (310). By presenting data centres as a stand-in for the “globally dispersed forces that actually drive the production process”, corporate images of data centres enact what Appadurai has called “production fetishism” (41). Building upon Marx’s theory of commodity fetishism, Appadurai’s concept of the production fetish addresses the way in which locality – the local factory or other site of production (in this case the data centre) – “becomes a fetish” to the extent that they conceal geopolitical and transnational relations that are vital to the production of the cloud.